The Dark Studio had a wonderful time at the premier of Celtic Soul this past Friday evening, November 25. We are very appreciative of the opportunity and look forward to seeing the film move around the country in various cinemas! The setting for the conversation is a café on College Street in Toronto. The table is littered with coffee and teacups and the remains of pastries. Me, I’m sitting with Jay Baruchel and Eoin O’Callaghan and we’re actually talking soccer. Just three guys shooting the breeze about players, teams, managers. Around us in the mid-morning quiet, elderly Italian men are doing exactly the same. Eoin’s views on most soccer matters are already clear to me. I’ve known the 30-year-old Irishman for years, since he was an anchor on Fox Soccer Report, a much-missed nightly soccer news program, made for the Fox Soccer channel out of Winnipeg, of all places, in the mid-2000s. We have sat in cafés and bars in Winnipeg, Toronto, Montreal and Dublin talking the hell out of soccer. Jay Baruchel, the 34-year-old actor from Montreal, is not someone I know in the same way. But I feel I know him a bit. I’m tempted to just call him “Jay.” See, I’ve been hearing about Eoin’s adventures with Jay for years. The artistic culmination of those adventures is the reason for meeting in this café. It’s Celtic Soul, a beautifully eccentric road-trip documentary in which Eoin takes Jay to the west of Ireland to connect with his Irish family roots, and then on to Scotland where Jay sees, for the first time, Glasgow Celtic play. Celtic is his favourite soccer team. He’s been a fanatical supporter since he was a kid. Eoin, too, was swept away – by Jay’s fixation on Ireland and Glasgow Celtic. He cooked up the premise of the doc – take Jay to Ireland and to see Celtic play in Glasgow, a journey home to connect with ancestry; a coming-of-age tale ending in an assignation with what fascinated Jay as a child. Jay liked the idea and, although his schedule is always full, he committed to doing it. One February day, a jet-lagged Jay turned up at Eoin’s place in Dublin and they got started. One of those moments is Jay, standing in the rain in Westport, County Mayo, looking for the exact location of the home of his mother’s ancestors, the O’Malleys. A local man, whose door he knocked upon, pointed him down the street. The place where the O’Malley house stood is empty, the progress of the town having eliminated part of the street. Barely able to contain himself, Jay looks around. “I’ve walked this town dozens of times on Google maps. I know every inch of it,” he says. Then he begins a small, passionate rant about how Catholics, back then, were second-class citizens and the records of their lives mattered less. There are funny moments surrounding the poignancy. In part, Celtic Soul is just two lads in a car, riffing on the Steve Coogan/Rob Brydon movie The Trip. Eoin and Jay amuse themselves imitating BBC radio accents and Jay complains about Eoin’s driving. In Galway, Eoin takes Jay to a Gaelic hurling match. A small fuss is made about Jay’s attendance when the match ends. One member of the hurling team makes a presentation to him. But no one seems terribly sure who Jay is, exactly. They know he’s famous though. Then the camera pans to the hurling player signing autographs for his fans, not Jay’s. The guy with the hurley stick is definitely famous in Galway. The film’s deft fusion of fun and heartfelt personal discovery becomes emotionally rounded and complete in Glasgow. Celtic is a unique sporting institution. The club was founded as a charitable organization in St. Mary’s church hall in the Catholic slums of Glasgow in 1887. When Eoin and Jay visit the current parish priest at St. Mary’s, he explains, in hushed tones, the seriousness of purpose behind the soccer club: Raise money for charity, feed kids and keep them in school. Jay is awed by it and, when the priest presents him with a personalized Celtic jersey, the gesture has a religious quality to it. 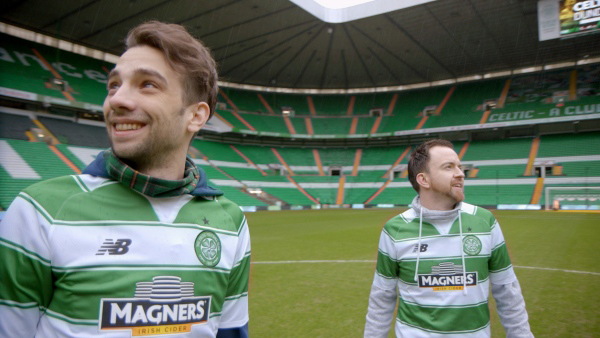 In the end, Eoin and Jay see Glasgow Celtic play Inverness at Celtic Park. Before that, they are given the extraordinary honour of playing soccer with Celtic players at their training ground. It’s a gorgeous scene, the journey into the misty fields. Neither of the visitors is very good at the game. But that’s all right – they made a marvellous documentary film that’s funny, tender and full of warmth and wisdom about finding home, where your soul belongs. Well done, the lads.